Nearly six months after production began in South Africa, MGM Studios' long-awaited Tomb Raider reboot has now wrapped. The production had finished the South Africa portion of the shoot in early May, according to director Roar Uthaug's Twitter account, with shooting then shifting to Leavesden Studios in the U.K. for the final leg of principle photography. While we don't get to see any of the cast members in a final set video shared by Uthaug, the filmmaker tries to showcase as many of the crew members as possible as the shoot comes to a close. Roar Uthaug debuted this video on his Instagram page earlier today, where he announces the picture wrap and thanks his cast and crew for all of their hard work. Now the arduous process of post-production begins, with the director getting roughly nine months to put his movie together. The director did share a few photos from the set during production, although there are other directors who often share much more while cameras are still rolling. As the editing process now begins, it's possible that the filmmaker could share even more images and perhaps videos during this last lap before theatrical release. 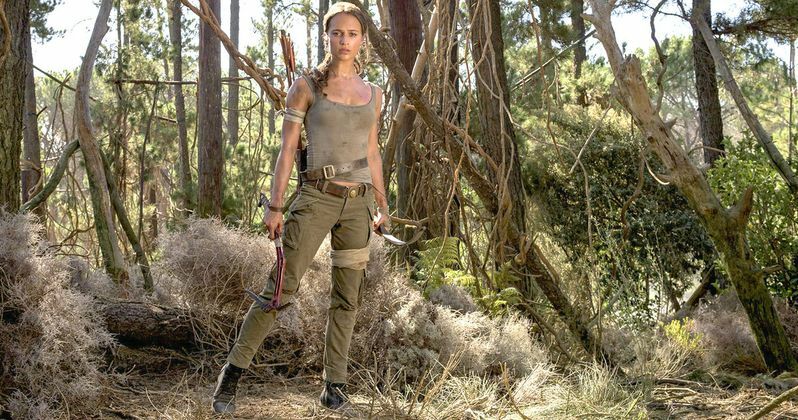 We got our first official look at Alicia Vikander as Lara Croft back in late March when MGM unveiled the first three photos, but we haven't gotten a glimpse at any other cast members quite yet. The cast also includes Walton Goggins as the main villain, and while his character's identity has yet to be confirmed, he is listed on IMDB as playing Mathias Vogel, a villain from the video games. The cast also includes Dominic West as Lara's father, Lord Richard Croft, Daniel Wu as Lu Ren, Hannah John-Kamen as Sophie and Alexandre Willaume as an unspecified character. It has previously been confirmed that this movie will be based on the current Tomb Raider video games, which was first released in 2013 and rebooted the original video game series. This movie will provide a new origin story for Lara Croft, the fiercely independent daughter of an eccentric adventurer who vanished when she was just a teenager. This version of Lara is 21 years old, working as a bike courier in East London, while refusing to take control of her father's empire after he disappeared, but now she finds herself drawn to finding out what happened to her father, despite his final wishes that she not do so. Young Lara Croft leaves everything she knows behind in search of her dad's last-known destination: a fabled tomb on a mythical island that might be somewhere off the coast of Japan. But her mission will not be an easy one; just reaching the island will be extremely treacherous. Suddenly, the stakes couldn't be higher for Lara, who, against the odds and armed with only her sharp mind, blind faith and inherently stubborn spirit, must learn to push herself beyond her limits as she journeys into the unknown. If she survives this perilous adventure, it could be the making of her, earning her the name tomb raider. Roar Uthaug directs from a script by Geneva Robertson-Dworet, with the movie hitting theaters March 16, 2018, going up against an untitled Greg Berlanti film. Take a look at the final video from the set of Tomb Raider below.